Hp looks like the trend for awhile. Has to be amongst the least inspiring autumn/winters in recent memory in terms of interesting weather, personally don't think I've experienced a single day of interest since the heatwave ended in July, just endless damp greyness! Takes a while to get there no doubt! Hopefully as the Strat warming takes effect we will see soon it showing up the runs. Last edited by Captain Snow; 22-12-2018 at 17:08. Slack HP looks like it'll dominate the set up for a while yet. ECM showing a big cold plunge into Europe out in the unreliable timeframe. Is this a sign of the SSW taking effect ? is the cold air mass going to make it over this far ? Can only wait and see . Looks interesting. On the other hand the GFS shows the HP being swept aside by a very vigorous Atlantic ( cold N and NW'lys ) at about +240 hrs with a strong Jet making it's way out of the US. To note that the US is expecting some big snow storms this week which may aid the jet's strength .This is way out in FI so just an observation to look back on to see which model was pointing more in the right way. With a significant stratospheric warming incoming next week onwards, the model output should become crazy for the New Year with lots of different solutions being generated as they get to grips with tropospheric impacts from the event. Model output is going to be useless generally for the next two to three weeks. Only proves what I said a week ago. ECM 12Z showing the Atlantic churning up LP's out at the end of the run. Hard to find any common trend between the models but there seems to be a leaning towards the Atlantic making it's presence felt more on Ireland around Fri / Sat of next week , going by this evenings run anyway. A lot of commentary about the possibility of huge uncertainty in the charts over the coming weeks due to SSW . Intriguing stuff , we will see. One other notable chart is the potential of cold air mass spreading over Europe and reaching the UK briefly around next Thurs on the ECM 12Z run. 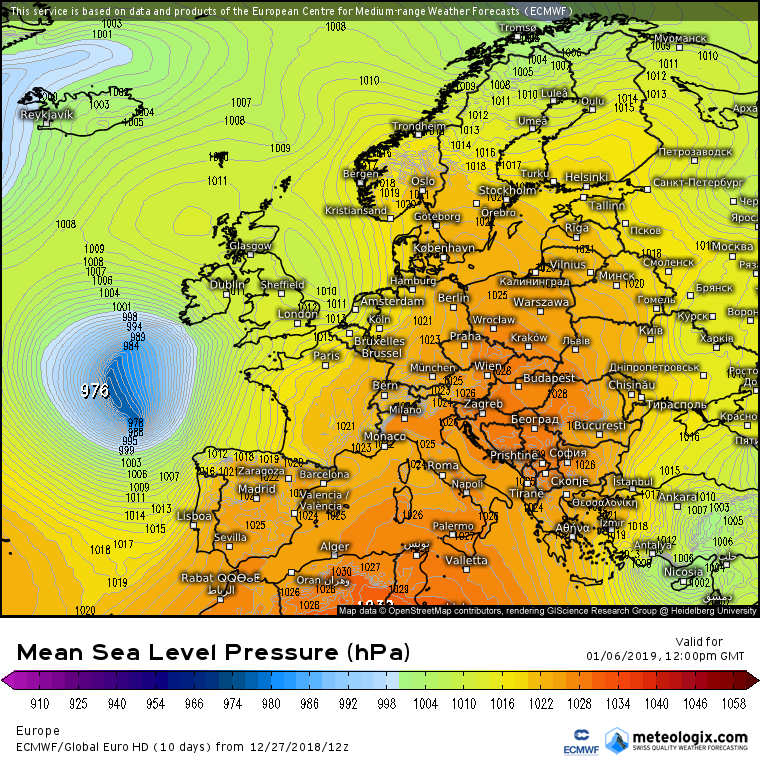 No sign of this on the GFS or GEM , UKMO at +144 hrs ( weds 2nd ) showing HP well anchored over Ireland and the UK at 1040 hPa. Well today the ECM has the HP close to us out to the end of the run at +240 hrs , keeping the Lows well away from our shores and keeping the very cold air mass over Europe, does show colder days / frosty nights perhaps from +120 hrs. UKMO HP out to +144 hrs at least. GFS shows the Atlantic starting to take over from +192 hrs with the HP not featuring after that and atm showing a lot of SW'lys and W'lys out in FI , so a big difference here between the ECM and GFS. Gem holding on to the Hp longer than the GFS and shorter than the ECM where it eventually shows Lp close to us by +240 hrs. These generally keep the cloudy conditions that we've been having for the past while, right? In Cork at the moment and there hasn't been a single minute of sunshine for the past five days. It's stronger in the reliable timeframe than the 0z was as well, which would somewhat boost the chances of the FI charts verifying. 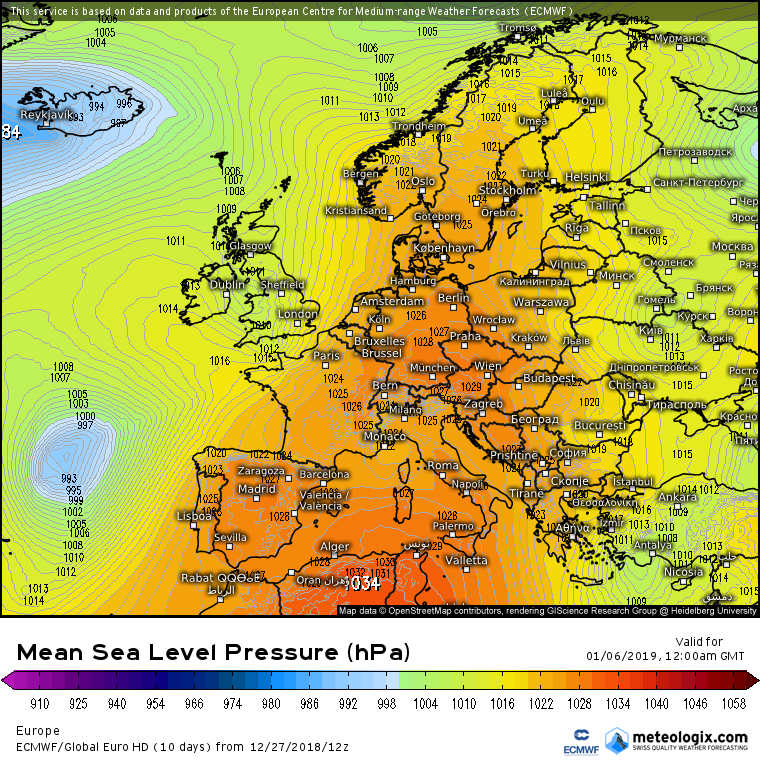 Beautiful charts to see at this time of year - not the snow most of us are looking for, but not the usual windy, rainy muck we can often have in and around New Years either. I'll take it. Coupled with what's going on in the strat, it also potentially opens the door to the block expanding northward throughout the rest of the run, which alas I won't be online to see roll out Enjoy! Big pool of cold air heading into Europe in F.I on the ECM - and the start of an easterly/north easterly air flow over Ireland. Long way off but probably the start of the crazy F.I charts from the Strat Warming.